but I did not know what I was waiting for. I decided that waiting in itself is beautiful, so it was. - am I still waiting ? This period includes also much poetry. I wrote about waiting, timing, and being in time - read some in Poet. "I love your art!...... There is a sense of profound quietude, understanding, and subtle strength in your imagery, in what you do. It speaks to my soul.....and...... I love what you post! " "Simplicity and solace. Great use of complements. Splash of warmth. Fantastic." I like that you have conversations with yourself on every level. What a great week as the artist of said week you lovely girl." 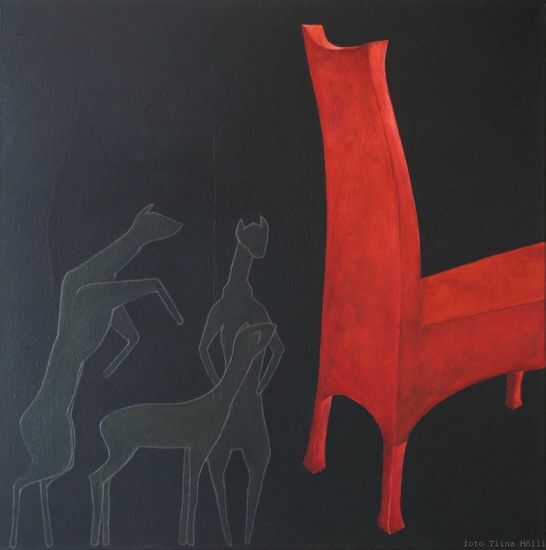 "Tiina - the poem is a beautiful accompaniment to the painting - both have a revealing meditative quality - by that is meant a deep sense of self-reflection. Congratulations! :)"
"Congratulations Tiina. The artwork above reminds me somewhat of Marc Chagall's style as far as atmosphere. His work often had a textural, and faint, but not completely smooth background, and often no real middle ground, going right to the foreground subjects, that were not always complete. I like your minimalist style and arrangement of forms. His work was often quite full of furious and curious related and unrelated connections of things. Good artistry. :)"
"Un tema ed una risoluzione dualistica: il fiore e una casa. Si può pensare ad una pittura naif dove l'ingenua semplicità è di per sè un messaggio." "Un pezzo di materia pittorica interessante nella sua essenzialità!" "Hello Tiina. It sounds ever so cold where you are. The miracle of the artwork you present is that it is so 'green with life' and beckons a visitor to sit. It's a pleasant thought anyway. Cheers!" "The brilliant expression of the sense of expectation! A magnificent work in color and style." "I really liked the sensitivity and evocative mood in Tiina's Work!, Adrian"
"I love the weirdness of your ART ... the colors and shapes are delicious!" and specifically your series " 4 x 28 = 107 ''. Thank you for sharing your work to us." "Nice work, I like your color palette, it's fresh!" "Mark, thank-you for introducing me to Tiina Holli's works. Her site is very interesting and her works, more so....."
Very Zen... Damn, I become more envious by the moment! LOL!" "Tiina, this "Waiting" is great! Tiina, dear Tiina. I came close to forget saying you how much I love visiting your site. However you know how it difficult for me to read poetry (but I liiike yours) and watching paintings that are not strictly figurative. But I liiike yours!!!" "Nice Painting, Artist of the Week! Kudos!" "Thank you, Mark and Tiina. Nice and fresh!" "Lovely painting Ms Artist of the Week! Do we get to see more of your work, Tiina?" "I love this painting very much. Thanks for sharing your lovely piece of art." "Wonderful website and body of work Tiina. I enjoyed browsing." "I don't think you really sleep Tiina. You lie awake, hooked into the matrix, thinking about the nature of reality and answering posts." "Congrats Tiina! Nice to see your new, strong work. It's also stimulating to read your voice, so smart and full of humor... it brings back nostalgia for the rich conversations we engaged in before Linkedin dumbed down to discourage discourse..."
"Holli, about the painting; nice discussion!" "Congratulazioni! E' molto espressivo. 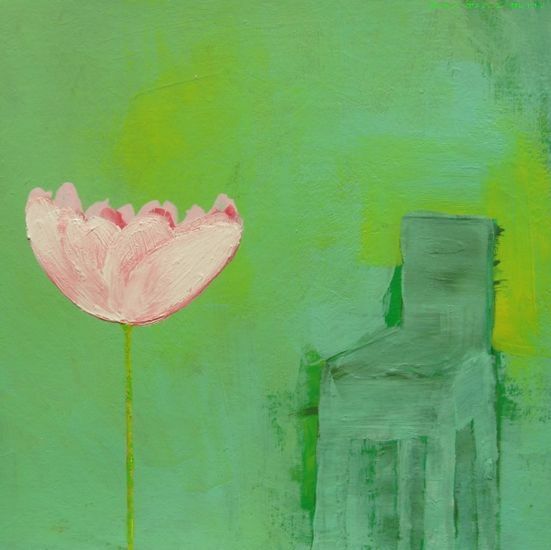 Gabriella Sciacovelli"
"Solitary Garden Green With A Springtime Pink Blossom Ever Waiting.."
"Well Tiina, your art has feet in the ground and it is solid, at the same time as it is esoteric. Happy to see it in here!!" "Congratulations Tiina! What a great article ! Loved it. Well worth reading." "I went to creative 4 room and listened to your interview. I enjoyed the interview. The Art. ( ... ) Oh I did follow that "hanging out with people you admire" article. It is why I hang out with you. You too are a good friend. Your Artwork is quite awesome for me. So there!" "Your interview speaks a lot to me, especially when you are talking about silence, the fact that you are a pure example of the Jungian theory of age period :) (so-am-I !!!!) , when you are saying that "I was born. I survived. Not a pretty picture. After a few years I realized Hey ! I am Alive ? ! ? I started to Be." and funny stuffs like you would hire three secretaries who would work for free only for the love of working (so-would-I !!!). Thank you :)"
"I liked what I read the interview was like talking to a good free spirited friend, u love what u do ,and do what u love, the line "time is irrelevant somehow it does not exist"! !! Understood." Thank you so very much. What can I say. Wow.